Eddie Redmayne took his sharp style to the Arlington Theatre in Santa Barbara, California yesterday for the 28th Santa Barbara International Film Festival’s Virtuoso Award Ceremony. Many of you gave the thumbs down to Eddie’s Hugo Boss brown suit at the 2013 SAG Awards, but I’m pretty certain he will get back in your good graces swiftly with this Tom Ford Spring 2013 suit. 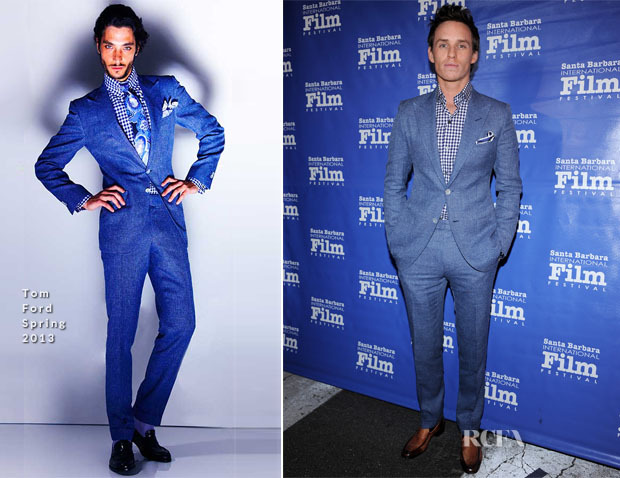 His two-piece blue chambray suit was styled with a blue-and-white gingham shirt which complemented his pocket square. My favourite Eddie look was the Alexander McQueen suit he wore to the ‘Les Mis’ New York premiere, but this ranks a very close second. I constantly admire his wide range of suits, which he styles so handsomely. Singlehandedly, he is keeping me interested in menswear.